The SRT Annual Educational Conference is a Conference that is organised by the SRT Committee and is truly a meeting where radiology trainees are the primary focus. The programme is designed entirely with trainees in mind and speakers are invited based on their ability to provide engaging and enjoyable teaching to trainees. Strongly supported by the RCR, issues relevant to radiology trainees will also be discussed. The event also enables radiology trainees to showcase their work and present at a National Conference. 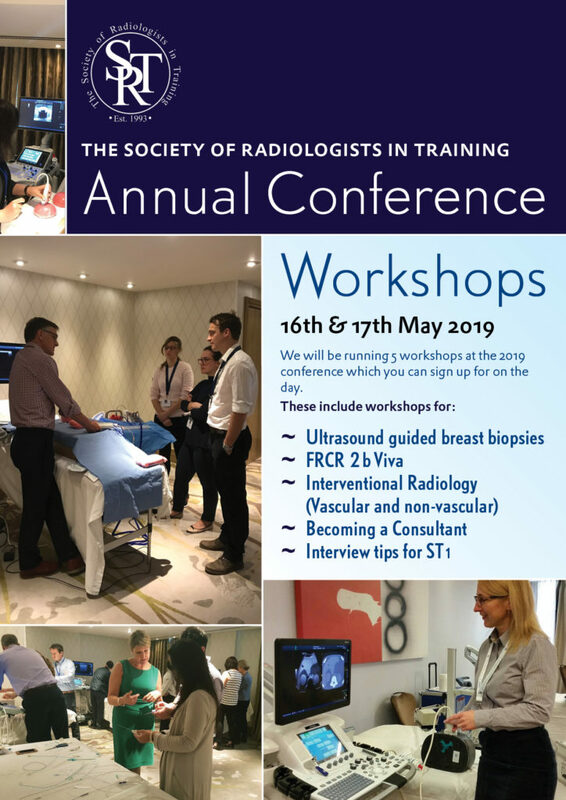 Every year we are supported by the British Subspecialty Radiology Societies who sponsor poster prizes at our conference. This year we are delighted to announce that 10 British subspecialty societies are sponsoring poster prizes! A list of the poster prizes can be found here. Our 2019 Programme covers a wide variety of specialties and is packed with interesting and educational presentations that will help with on-calls, exams and general day-to-day clinical practice. Our Keynote Speaker is Dr Vikas Shah (Co-Editor of Radiopaedia) and there will also be a video exclusive from the Founder of Radiopaedia, Prof. Frank Gaillard, on Errors in Neuroradiology amongst many other prominent names in Radiology! 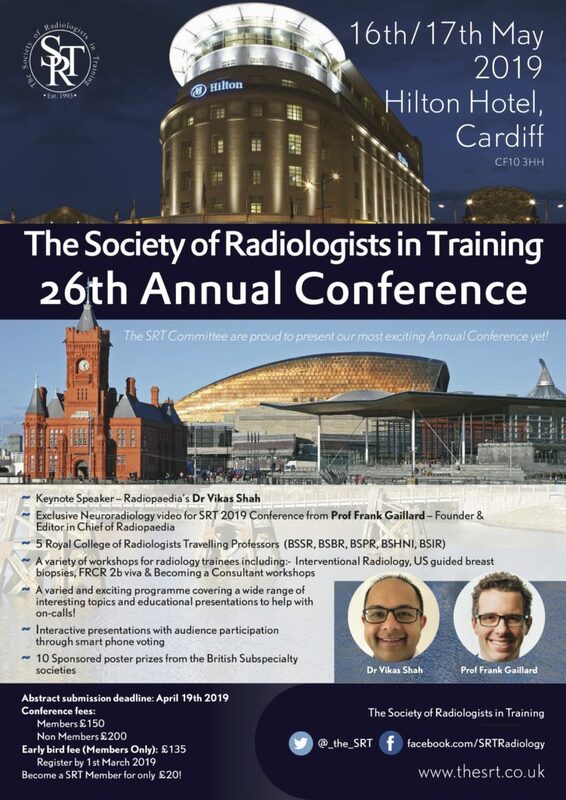 We guarantee you will have a great time at the 2019 SRT Conference where you can learn in a relaxed environment from high profile speakers and we hope you take this opportunity to network with like-minded trainees. Click here to view our Conference Programme. To register online for the 2019 Conference click here. We also run great workshops at our Annual Conference which you can sign up to on the day on a first come first serve basis. – Please include your name and the abstract title in the document title. – By submitting, you are confirming on behalf of the co-authors that this is your own original work and that you have the approval from the co-authors. Posters must be displayed by 08:45 on 16/5/19. On the day of the event, you will be assigned a poster board and given Velcro/pins to display your poster.